Trevor Geise is writing on the Svbtle network. I’ve begun building a registry/wedding info site for my wedding in the Spring. We try to not accumulate a lot of stuff, and thanks to hand-me-downs we have pretty much everything we need, so the idea registering at a store just didn’t make much sense to us. Instead, we decided to just ask people to give us money, but that’s pretty crass. The solution! To let people pick what we spend it on, specifically, elements of our honeymoon in Japan! Going one step further, we wanted to give unique gifts in return, a la Kickstarter. So I decided to build out a mini Kickstarter parody site that let people pick items that they want to gift us, but to do that, I needed a nice logo. So here is the crazy-fast process for creating a parody logo. Easy, peasy. Just download that sucker. FontSquirrel has a pretty sweet web font generator. Just head over there, upload the font you just pulled down. Bingo, bango - you got yourself you web font. So to finish we just want to grab the iconic Kickstarter colors. 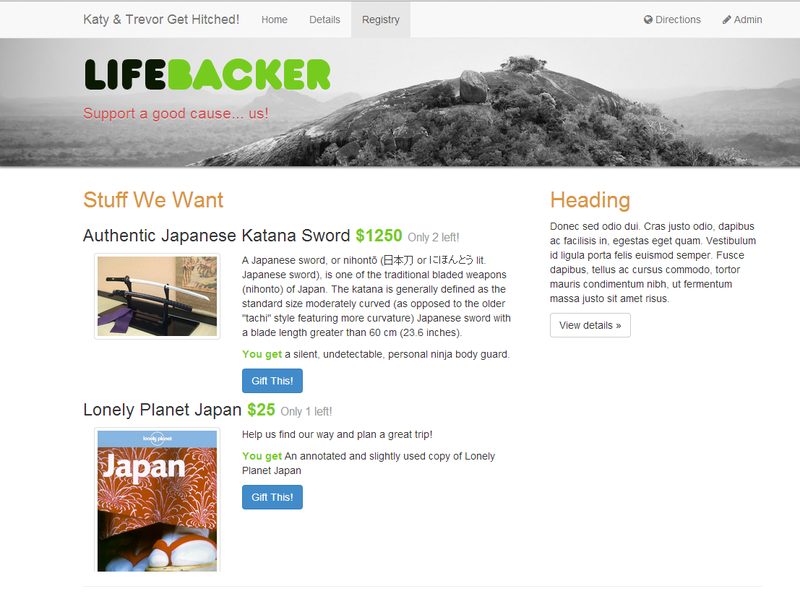 I head over to Kickstarter.com. Pop open the ol’ web-inspector kit in Chrome. Inspect the logo and grab out the colors from the CSS. Now in my case I make a ksGreen class and a ksGrey class. Now I am already to make whatever name I want in a great looking kickstarter parody font. Crazy easy. Of course you will have more trouble with logos that are not just a font, but I’m sure you’ll figure it out. I’m a developer, and you can too!